The modern parish of Forncett is located in south Norfolk, about 6km to the southeast of Wymondham and about 0.5km west of Long Stratton. It is fairly large and L shaped. This unusual shape was created in the early 20th century when the former parishes of Forncett St Mary and Forncett St Peter were united. There are three villages within the modern parish. Forncett St Mary and Forncett St Peter are located in the east and are an intermittent strip of buildings based around the Tharston to Aslacton road, close to the River Tas. Forncett End is a village that was established relatively recently. It is located in the west and merges into the village and parish of Tacolneston. A series of hamlets and farms are scattered throughout the parish and include Bustard’s Green, the Grove and Brock’s Watering. A reasonable amount of archaeological work has been carried out in Forncett parish. There have been a few excavations, a large amount of metal detecting, some fieldwalking and a number of stray finds. Although some areas have seen no work, archaeological sites and artefacts have been recorded more or less throughout the parish. As a result, informed observations can be made about past settlement and patterns of activity. Prehistoric flint artefacts have been found at sites throughout the parish. They have been found close to the River Tas, close to a tributary of the River Tas and on land rising up from both of them. The flint artefacts include scrapers, flakes, a Neolithic leaf arrowhead (NHER 24359) and two Neolithic polished axeheads (NHER 10020 and 39378). Burnt flints have been found at a number of sites. At two sites these may indicate the presence of prehistoric burnt mounds (NHER 16878 and 17423). At one site burnt flints were found in a prehistoric pit (NHER 24461). Two possible Bronze Age barrows have been recorded on land rising up from the River Tas. The presence of one (NHER 15356) is suggested by the placename 'Barrow Field' which is marked on the Forncett tithe map. The second barrow was called ‘Nunmete Hill’ (NHER 10044) and was excavated in 1465 when '100 shillings' worth of Roman coins were found. Their discovery is probably the first recorded 'archaeological excavation' in Norfolk. It is most probable that ‘Nunmete Hill’ was a Bronze Age barrow that was reused in the Roman period. Bronze Age objects found in the parish include fragments of pottery, a flint arrowhead (NHER 10021), a copper alloy spearhead and two copper alloy axeheads (NHER 31418 and 31949). These have been found at sites close to Forncett St Mary and Forncett End villages. Late Bronze Age or Iron Age pottery (NHER 10019) has been collected at one site, with Iron Age pottery recovered from six sites scattered throughout the parish. During the 1990s metal detectorists discovered a Late Iron Age or early Roman hoard (NHER 31949). It was probably buried in the 1st century AD and included over 300 Iceni coins and more than forty Roman coins. Two other Iceni coins (NHER 10046 and 31418) have been reported in the parish, as has an Iron Age brooch. Roman artefacts have been found throughout the parish. The objects collected include pottery, building material, coins, brooches and other metalwork. Fieldwalking and metal detecting have revealed the site of a possible Roman settlement (NHER 16780) and the site of a possible Roman building (NHER 10030) in the west. A second possible settlement (NHER 31418) has been identified close to the River Tas. Finds of Early Saxon date have been recovered from sites in the centre of the parish. They include brooches, strap fittings and a wrist clasp. 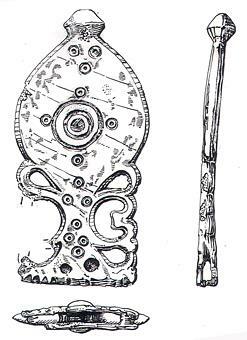 Middle Saxon strap fittings and a brooch have also been found. Middle Saxon pottery is recorded from two sites, one near Forncett End and in Forncett St Mary village. The pottery from Forncett St Mary could suggest that the present village’s origins lie in the Middle Saxon period. As Late Saxon artefacts have been found in both Forncett St Mary and Forncett St Peter villages it is probable that both functioned as settlements during the Late Saxon period. Objects found include pottery, a brooch, strap fittings and fragments of stirrups. Late Saxon pottery has also been found close to Bustard’s Green and to the south of Forncett End. It is possible that the Bustard’s Green hamlet was in existence and that there was a settlement south of Forncett End during the Late Saxon period. The Bustard Green pottery was found relatively close to the suggested location of ‘Twanton’ (NHER 10065), a settlement listed in the Domesday Book of 1086. The Forncett End finds could come from the site of ‘Kettleton’ (NHER 10025), a settlement also mentioned the Domesday Book. A survey of 1565 shows areas called Rattongate and Haliards, both with streets and houses. These are located close to where some of the pottery was found and may have been part of medieval/post medieval ‘Kettleton’. Forncett End is probably the modern successor to ‘Kettleton’. In the Domesday Book ‘Twanton’ was named ‘Tuanetuna’ and Kettleton was called ‘Kekelingetuna’. Both were held by Count Alan and Roger Bigot and ploughs, meadows and oxen were recorded. A church was noted at ‘Twanton’. Roger Bigot, Bishop Osbern and Baynard held ‘Fornesseta’. The placename is Old English or mixed Old English/Old Norse meaning ‘Forne’s or Forni’s dwelling place’. As no distinction was made between Forncett St Mary and St Peter the St sections may be medieval or later name attachments. A church, ploughs, meadow, cattle, sheep, horses, pigs are recorded. The two churches recorded in the Domesday Book could be St Peter’s (NHER 10048) and St Mary’s (NHER 10075). Both may include late 11th century work and it is probable that there was a church at both sites by 1086. However, the church mentioned in the Domesday entries for ‘Twanton’ may not survive, having been on or close to the proposed site of the settlement. If so, either St Mary’s or St Peter’s was not recorded. As not all churches known to have existed in the Late Saxon period are recorded in the Domesday Book, this does not preclude the possibility of a church at both Forncett St Mary and Forncett St Peter in 1086. Four possible medieval moated sites survive in the modern parish. One is located on the edge of Forncett End (NHER 32075), another is in Forncett St Peter (NHER 10083), one is close to the site of ‘Twanton’ (NHER 10069) and the last is at The Croft (NHER 18107), Forncett St Mary. The Croft is an important early 16th century timber framed house with later additions. The possible moat at Forncett End is to the west of the late medieval Chestnut Tree Farm farmhouse (NHER 32075). The site of a medieval manor house (NHER 29838) is marked to the north of St Mary’s church on a map from 1565. The site of a medieval windmill in Forncett St Peter was recorded around the same time. Late medieval houses in the parish include Yew Tree Farm, 18 Bentley Road and The Cottages. All were first constructed in the late 15th or early 16th century. 18 Bentley Road (NHER 32887) has an important and complex set of ritual features including post medieval wall paintings on a chimney stack and painted crosses on ceiling beams. Until about 1905 a medieval field system (NHER 10062) survived in a field north of Forncett St Mary. In Forncett St Mary are the earthworks from a medieval hollow way and ditched enclosures (NHER 32871). The hollow way follows the northern boundary of 'Julion's Green', a green recorded on the site in 1565. The ditched enclosures were probably constructed following post medieval enclosure of the green. An enclosure (NHER 36349) visible on aerial photographs in the north of the parish probably represents medieval or post medieval enclosure of land on Loughen Common. There are a large number of post medieval buildings in the parish. They include a rectory, houses, a steam mill, farmhouses, barns, stables and cart sheds. Bishop’s House/ White House (NHER 39773) is a high status post medieval timber framed house surrounded by probable medieval earthwork banks. Limetree Farm (NHER 33500) has an important group of 19th century clay lump farm buildings. Grove Mill (NHER 44433) is a 19th century steam mill, one of only a few in rural Norfolk. The sites of two post medieval windmills are recorded in the parish. Both stood close together beside the modern B1113 Norwich to New Buckenham Road. One (NHER 15969) was built before 1791, last used in 1908 and collapsed in November 1917. The other (NHER 15670) was built in 1824, last used in 1896 and demolished in September 1932. Close to the two windmill sites is St Edmund’s Church, Forncett End (NHER 10036). This is a small red brick church and was built in 1904. David Robertson (NLA), 15 December 2005.